A headline today from RT reported Russia now has more nuclear weapons than the US: http://rt.com/news/193604-russia-nuclear-capacity-start/ This is accurate. Russia and the US have far more nukes than any other country on Earth: http://www.ploughshares.org/world-nuclear-stockpile-report. But both governments also hide how many missiles they really own and very few people know where their missiles are hidden. Every government agency so severely misunderstands the “security dilemma.” They think more weaponry makes them safer when in reality it does the opposite and perpetuates the security dilemma. Whistleblowers like Snowden, Assange, and Manning have selflessly revealed the ugliness of war and profiteering behind it. Revealing confidential state information is only called a threat to national security because the government has incriminating secrets to hide, all of the most dangerous weapons, and they have to justify owning them and committing war crimes. If they feel like they’re about to lose their war toys and the capacity to oppress and rob the world due to resistance, then they often label those resisters as “terrorists” disturbing national security and they stock up on more war toys in response. When they get to define what national security actually means and they get to keep it secret, they can stifle all legitimate dissent. Saying it’s “just a job” or “I work to feed my family” is not an excuse for this. We all have to struggle to get what we need in the current state of the world. The US is not the only country with a bloated military, abusive, overpaid police forces, and an arsenal of nukes. (Nukes aren’t the only problem either, of course. I think the most destructive missiles need to be dismantled first (starting with ICBMs, long, then intermediate, and then short-range missiles) warships, fighter jets, and all chemical agents of warfare meant for deforestation. The effects of these is felt for generations. Birth defects occurred in Japan for decades from the radiation left in the wake of the bombings of Hiroshima and Nagasaki. Birth defects in Vietnam also occurred for decades from the USG use of defoliants like Agent Orange during the Vietnam tragedy. Iraq is still experiencing very high infant and maternal mortality rates because of the USG use of thermobaric nuclear missiles on Iraqis. The destruction in Iraq and the disregard for human life have laid the seeds for ISIS, and the spread of radical militant Islam, (especially Sharia Law) unfortunately, instead of loving and peaceful Islam, which is much more common. The five permanent members of the United Nations Security Council are China, France, the UK, Russia, and the US. They all have nukes. Their representatives also wield a disproportionate amount of influence in the UN largely because of this. Pakistan, India, Israel and North Korea also have nukes. They aren’t likely to use them but no country should have nukes. Russia and the US should start dismantling first so their stockpiles at least resemble the relatively much smaller stockpiles of the other permanent security council members. Nukes don’t act as a deterrent. The number of nukes we have only makes mutually assured destruction possible if even one country uses one of them. This technology has only increased in complexity incredibly and in secret. Testing new nukes also hasn’t stopped. The governments of the US and Russia have dismantled many thousands of nuclear weapons since the nuclear nonproliferation treaties and the old Cold War days, but they have done this while increasing numbers of other types of arms exponentially. So we have a long way to go. The Cold War never really ended. The arms race just got more advanced and covert. But we still fight for the same reasons. There are major lessons to be learned from the Cuban Missile Crisis in particular. The USG’s deployment of ballistic missiles in Italy and Turkey catalyzed the crisis, to which Kruschev responded by sending nukes to Cuba. But Castro never wanted to use them. Cuba was having its government undermined by the CIA. All kinds of economic terrorism was imposed on Cuba and still is because of the “Red-scare” and McCarthyism. It’s likely Kruschev thought he was going to prevent an invasion of Cuba by giving Cuba nukes. But he just made the US government panic. The CIA never succeeded in overthrowing Castro, despite many attempts including the failed “Bay Of Pigs” Invasion. Castro is not innocent. Cuba’s government also seriously violates the rights of Cubans, but the US government wasn’t going after Cuba because they care about Cubans. The point being increases in arms are often caused by false flags and attempts to protect other countries from feared invasions and coups by more militarily powerful countries. “Innovation” in machines that kill people are still seen as positive, especially in Israel. They lure kids in with talks about their “birth right” trips, and they ultimately try to use the best engineers for the worst things on Earth like building missiles, which perpetuates the “security dilemma.” This “dilemma” is entirely manufactured so that billion-dollar weapons manufacturers like Lockheed Martin, Boeing, and Aegis can make more money. Somehow some people still feel like these companies are “necessary” for “protection.” But a country can’t take over another and then call their resistance the reason they’re fighting them or say that new nuclear installations in another country are reason to bomb them when they have nukes too. This double standard can’t exist. Another billion-dollar company that more covertly makes war machines is Caterpillar. 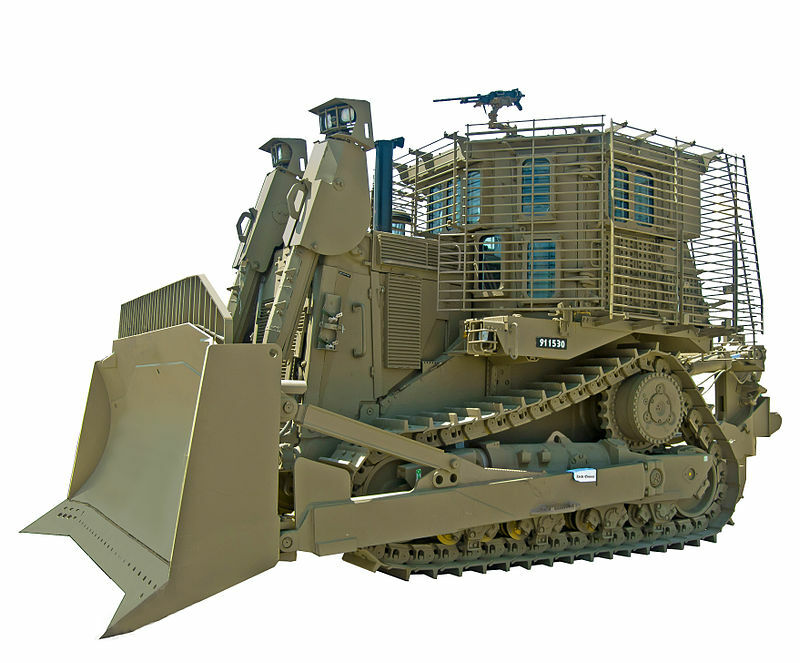 They manufacture armored bulldozers with turrets on them for the IDF like the IDF-9, nicknamed the “teddy bear.” They call their work in Palestinian territories “combat engineering.” But this is just a euphemism for genocide. Some of the time, nuclear enrichment programs are disguised as nuclear energy programs when the actual goal is to create weapons grade uranium. Natural uranium is 99.2% U-238 and 0.72% U-235. Reactor grade uranium is only 3-4% U-235 while weapons grade uranium is 90% U-235. But only 20% U-235 is needed for weapons. Fast neutron reactor cores require about 20% U-235, which means companies that procure uranium for fast neutron reactors are making weapons grade uranium. This is just another reason nuclear energy is a dangerous dead end. Billionaires who continue to dump money into wars aren’t smart. They are just greedy. I would gladly debate a billionaire who thinks I’m wrong via satellite. Bill Gates, the world’s richest man is still trying to convince people he’s a philanthropist when his “Foundation” is invested in Caterpillar and other terrible transnational corporations. I don’t know how one person can justify having more than one billion dollars. Billionaires will cast you off and explain you just don’t understand economics, but I do very well. I just see the economics being driven by vile, greedy instincts in which everyone and everything is for sale and a few profit financially from war while untold numbers of common people suffer.